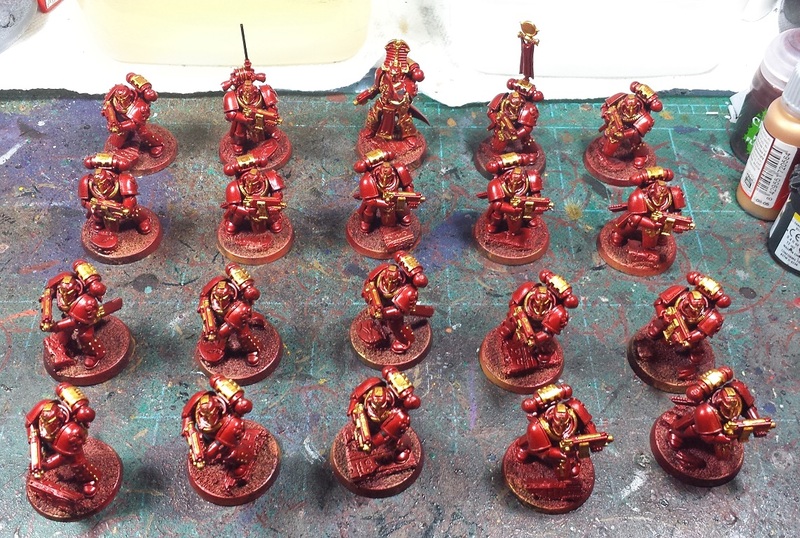 Mordian 7th Regiment: Heresy Era Thousand Sons - Tactical Squad Hesyre painting begins! 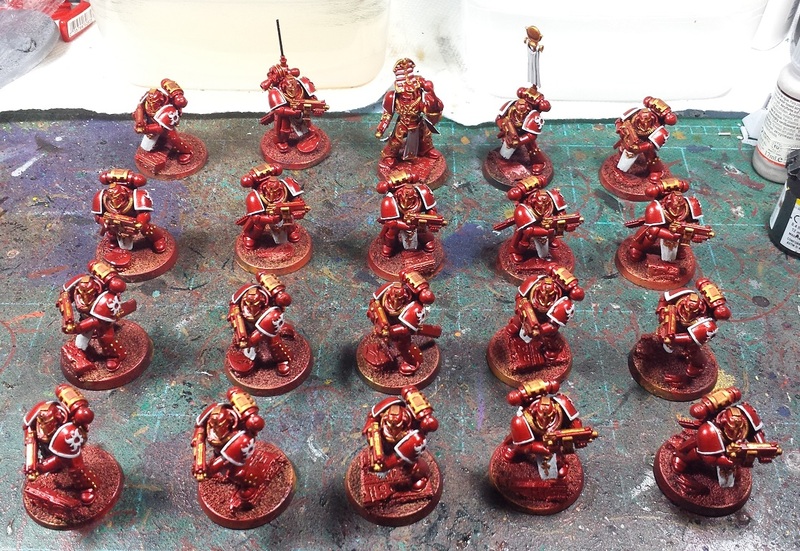 Heresy Era Thousand Sons - Tactical Squad Hesyre painting begins! It's been a while since I fired up the ol' batch painting servitor and after a few false starts it started cranking out the models again. Definitely felt good to be getting back to my favorite Legion! When I'd left off the models were more or less done with the red stage, so I went in and added a bit more shading here and there in the recesses, and painted all the elbow, hip and knee ribbing in black. Started one model's gold before I caught myself and snapped a quick pic! All the gold trim laid in and washed, definitely the most painstaking part as I definitely didn't want to spill onto the red, as I'm more or less unable to 're-paint' the red (one downside to the airbrush portion that I've run across for sure). Finally for the day's session was the basic light grey that will undercoat all the white areas. Definitely helps the models suddenly snap into focus and start to look like Thousand Sons! 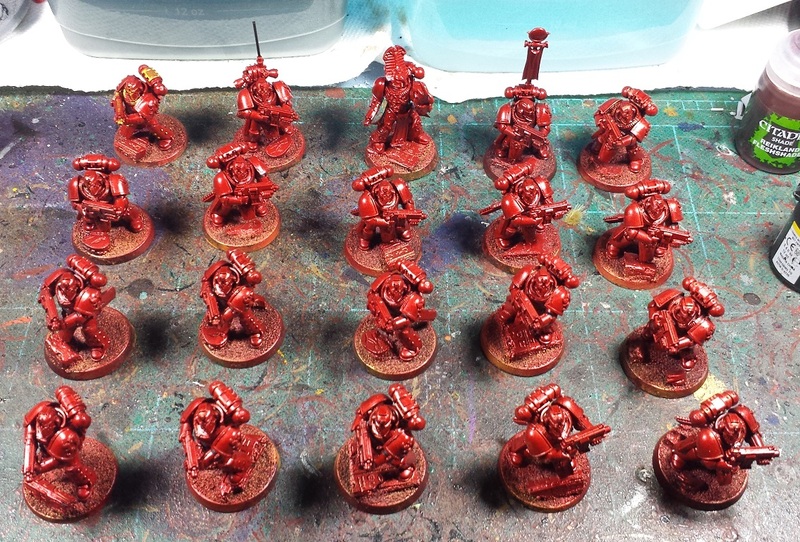 Tomorrow I intend to get the whites finished up, and lay into the various khaki, leather and bone colors. Moving right along! They are coming along nicely, the red is really nice. 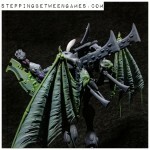 Is it the FW airbrush paint? Yes indeed the white really helps them pop and drags them into the right look. Well played. @NafNaf: Hah! Thanks man. It's a tamiya clear red over a gold basecoat - Still not 100% sold on it, I still kinda prefer the traditional brushwork look if I'm honest. @John Stiening: Cheers, man! It's all about audiobooks to distract me from the tedium and biting off discrete chunks of the project, I try and set a goal of two or three colors per session and before I know it there's a whole mess of 'em done! @Dai: Haha! 20 of these basic tactical guys wasn't too bad, they're fairly unadorned. Doing the 20 veterans on the other hand, that very nearly unmade me. Oof!